Because I love pot pies, this looks "scrumptious". What is the difference between a pot pie, regardless if it's chicken or beef and a shepherd's pie? If there is one? Hi Flo good to hear from you! You really must try this recipe then.... it's wonderful! Shepherd's pie is an English dish that is traditionally made with lamb or mutton (but not always) and it usually is topped with a layer of mashed potatoes. It often has a little broth with the meat and veggies, but not a thick gravy. 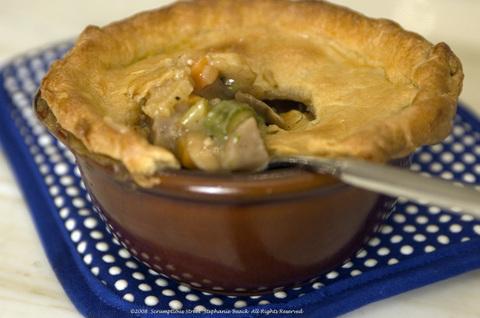 Pot Pie, is pretty much American classic and can be made with virtually any kind of meat and veg combination. It usually has a thick sauce, much like a gravy. 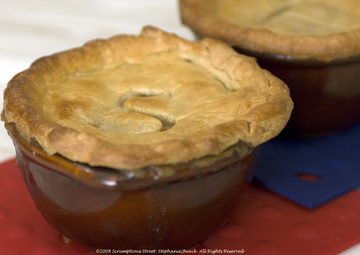 And, typically pot pies have pastry crusts such as pie doughs, puff pastry, etc. There can be either one crust or two, much like dessert pies/tarts. You get your choice. When I make large pot pies rather than individual, I always go for the double-crust so there's flaky, buttery goodness below and above the filling. The line between shepherd's pie and pot pie is definitely blurring, as more of us experiment and get creative.